It seems that the time flies faster each year as I get older. It is hard to imagine that a year ago I started running with my mom. It was so painful and we just thought that we would complete the Princess Half and never have to run again. Little did we know that completing the 13.1 mile run would create such an addiction. The good news is that if I am going to be addicted to something, running is great for the heart and health. Last year we were able to complete three races. I am ask often why do I do these races if I know I am not going to win. Well the great thing about running is that you are in competition with yourself. 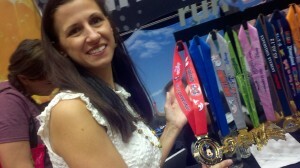 For each half marathon I completed my time was better each time. The same for the 5K races. So I would think that would be an accomplishment. My current pace is a 9.5 minute mile for short distances and 10.5 for longer distances. It would be nice to see better time this year. I have trained real hard for he full marathon that will be here in 11 more days! I am hoping that I have not over trained. My body and knee still hurts so I have been slowing down a lot. This morning I ran 3.5 miles at 11:30 pace with my mom. My first goal for the marathon is to complete it in under 5 hours but if I have trouble, I just want to cross the finish line. I did go to a physical therapy session this week and it helped. I have 3 more sessions to attend before the marathon. Hopefully it will make a difference. The PT worked on my IT band and gave me many wonderful stretches. Next Wednesday, I will be going back to the doctor and I am considering getting the cortisone shot. I know there are different opinions about this but I feel that I have worked too hard not to do the marathon. The shot will help ease the pain so that I can complete it. Once the marathon is over I will not be running as much and the It band problem should go away with less running. Here is a picture of the medal that I will get if I complete the marathon. It is real big. 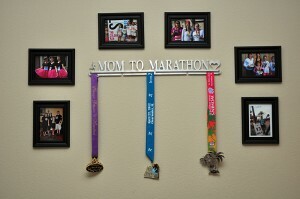 I used to have my medals in my closet but my husband made me this medal rack for Christmas and now it is over my desk. At least my desk is in my room in the office area so it looks nice with the pictures around it. I have a picture of each race and it brings a smile to my face when I look at it and can have great memories with the ones that I love! This year my mom and I looked at the running calendar and are looking forward to running some different events this year.We do want to do some fall ones but don’t see any up online. At least we know what we are doing for the spring. What races do you run? May your 2013 be the best ever! June, July, August- Way too hot! Beach time! December 9- San Antonia, Texas…Rock and Roll with our aunt and cousin!